The Eco Air ECO12LDT Dehumidifier is a convenient unit for use in any part of the home, particularly if there is a constant problem with moisture in that area. It has a continuous drain facility so the water collected can run into a nearby drain and auto-restart to get it running again after a power cut, both essential if your home will be empty for a few days. The Eco Air ECO12LDT Dehumidifier is capable of a water extraction rate of up to 12 litres per day, at 30°C and 80% relative humidity, and is recommended by the manufacturer for areas of up to 17m2 or 180 sq ft. This makes it suitable for smaller homes or an individual room within a larger house. This unit is very compact and will fit into smaller areas in a room where space is limited. It is only 13" wide by 10.25" wide so needs less than a square foot of floor space on which to stand. This dehumidifier also offers ease of movement to other locations in the home weighing only 9.5kg. The ECO12LDT Dehumidifier is designed for ease of use. Equipped with a simple rotary control it will appeal to those of us who find an array of switches lights and options bewildering. How many times have we heard people say..."my washing machine has 39 different programmes and I only ever use two of them!" Well, this is the dehumidifier for the many people who want a simple control for an appliance which simply does the job. All dehumidifiers for the home have water collection containers to catch the water removed from the humid air. Naturally the containers need to be emptied and sometimes we are asked, "..but what happens if I forget to empty it? A common fear is that the bucket will over-flow and wet the floor but this will not happen with a properly designed dehumidifier. The Eco Air ECO12LDT is properly designed so it has an auto-cut-off to stop the machine operating when the container is full. A more serious result of forgetting to empty the water container is that the dehumidifier will stop working until it is emptied. This prevents spills but also results in a loss of humidity control. To overcome this problem the Eco Air ECO12LDT Dehumidifier is configured for continuous drainage. A small plastic hose may be attached to an outlet in the dehumidifier casing and run to a convenient drain. Once this is in place the water collected by the dehumidifier will discharge as it is collected and remove the need for emptying the water container. This water flow depends on gravity so the drain must be lower than the outlet on the dehumidifier. For best results it may be advisable to raise the unit two or three feet above the floor if possible. The ECO12LDT is equipped with an adjustable humidistat to sense the level of relative humidity in the room and control the operation of the unit to maintain that level. This ensures that the unit does not run continuously and thereby saves energy. This is a relatively inexpensive dehumidifier, available from some suppliers at around £100, and it would be wise not to rely solely on the humidistat as these devices can be a trifle inaccurate in cheaper units. Hygrometers, used to measure relative humidity, can be purchased for around £20 and it may be a good idea to use one to double check the humidity level in the room. For comfort, freedom from condensation and mold and to deter allergen producing dust mites relative humidity at or just below 50% is advisable. The operating temperature range of the Eco Air ECO12LDT Dehumidifier is specified as 5°C to 35°C. All refrigerant dehumidifiers suffer from ice formation on the cold coil at lower temperatures and this ice has to be allowed or encouraged to melt before the dehumidifier can resume operation. Some dehumidifiers have an active defrost function which applies heat to the cold coil to melt the ice quickly. Such dehumidifiers are rather more expensive models. The ECO12LDT, in common with other less expensive dehumidifiers, simply stops until the ice has melted. Ice formation will start at an ambient temperature of around 18°C and the lower the ambient temperature the longer it will take for that ice to melt. As temperatures get lower the unit is likely to spend more time "de-frosting" than it does operating. This is quite normal in a room dehumidifier and it does not mean that the unit is faulty or ineffective. What is does mean is that, while this unit is entirely suitable for use in the home, it would be less suitable in a cold area, such as an unheated cellar or garage. For this type of application a dehumidifier with an active "hot gas defrost" system would be required. The Eco Air ECO12LDT Dehumidifier is a compact dehumidifier and relatively light weight. It is equipped with a top-mounted carrying handle and is a genuinely portable unit. The unit is also relatively quiet with a recorded noise output of 45dB. Dehumidifiers, particularly of the refrigerant type, will make noise. The main source of noise is the fan which draws in the moist air and expels the dried air. The more powerful the dehumidifier the larger and faster the fan must be, which explains why larger units are noisier than smaller ones. 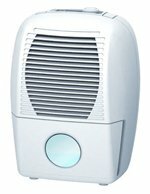 Even desiccant dehumidifiers have fans so are not exceptionally quiet. The second source of noise is the compressor, required for the refrigeration process, which is similar to the one in your refrigerator and sounds much the same. This unit is quieter than some but please do not interpret "relatively quiet" to mean that the noise will not disturb a light sleeper if the unit is in the same room.